If you follow my tweets, you saw that I made quite a special dinner last Monday. While brainstorming for my dessert course, the idea of homemade ice cream came to mind. With a cookbook and the internet, I decided to make salted caramel ice cream sandwiches! I’ve never made caramel or ice cream before. I waited about 18 minutes before I added the cream. The caramel never quite browned. I’ve been told that there’s a short window between caramel and burnt though, so I guess it was better taken off earlier than later? Also, as seen in the Twitpic’d menu above, the Maker’s Mark caramel drizzle unfortunately never made it to the plate. I just ran out of time. I also did not use a 10″ x 15″ baking sheet originally as seen in the photo below. A much larger sheet was used. I think a smaller one would help create a more even layer. Mix 1 1/2 cups plus 2 tablespoons of sugar and the water into a heavy casserole or deep pan so that it resembles wet sand. Over medium heat, bring to a simmer for 15 minutes, or until browned appropriately and sugar has melted. Do not stir before it browns. Immediately remove from the heat and slowly add the milk and cream. Stir to combine. In a separate bowl, whisk the remaining sugar (2 tbsp) and yolks until slightly thickened. Temper the egg mixture by adding the caramel mixture, little by little, starting with 1/2 cup and eventually adding the remainder. Have another saucepan ready. Once the mixture has been completely tempered, pour the mixture through a fine strainer and into the new saucepan. Prepare a large ice bath with a medium bowl in it. Heat the mixture in the saucepan over medium heat, stirring constantly until a custard forms which coats the back of a spoon. Strain once more, this time into the bowl which has been sitting in the ice bath. Add the salt and let cool, stirring every once in a while. Prepare ice cream using your method/machine of choice using the overnight chilled custard. To make the cake, preheat the oven to 350° F. Spray the bottom of a 10″ x 15″ baking sheet with non-stick cooking spray and lay out parchment paper. In a large bowl, whisk the butter and sugar, followed by the egg and vanilla. Lastly, add the flour, cocoa, and salt. Whisk until smooth. Spread the batter out onto the parchment, making sure to form as even of a layer as possible. Place in oven for about 12 minutes, checking the surface of the cake if it’s dry to the touch. Once dry, remove from oven and cool on a rack. Once cool, cut the cake in half. Place softened ice cream over one of the cake layers. Top the ice cream with the remaining cake and seal tightly with plastic wrap. Place the sandwich into the freezer until it sets. When ready to serve, cut the large sandwich into more desirable serving sizes. Enjoy! I’ve had bad luck in the past trying to fry tofu. It just never came out how it was supposed to. I now know how important it is to blot out as much water as you can! I’m a F&W subscriber and when I saw this in the pages of the December 2010 issue, I knew I had to try it. This was my chance at fried tofu redemption. Redemption was accomplished. The dish came out great! Definitely going to make this again. Slice tofu into 8 even slices. Place on paper towels and blot with extra paper towels until most of the water is gone. In bowl, whisk together soy sauce, sugar, red pepper, garlic, sesame oil, and sesame seeds. Set Aside. Heat around a 1/4″ of vegetable oil over medium-high heat in a large skillet until shimmering. Place tofu slices in pan and fry until golden brown, flipping once (about 4-6 minutes on each side). Once done, drain on paper towels. Stack 4 slices of tofu on top of each other. Top with sauce, then scallions. Serve alongside white rice. I have never cooked with (or eaten) tempeh, so last night was a whole new experience for me. I’m warning you now (in case you follow the recipe), I don’t think it turned out that well. Totally open for suggestions and/or comments on what I may have done wrong here or what I should do differently. Steam tempeh for 15 minutes to allow it to “swell” so it absorbs marinade better. In a large bowl, combine five-spice, soy sauce, mirin, and sesame oil. 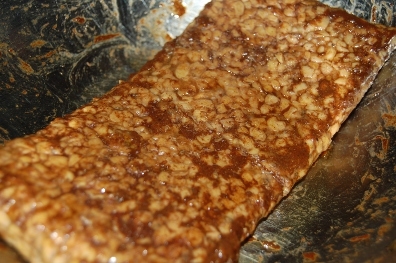 Once tempeh is finished steaming. Toss tempeh in marinade until coated on all sides. Let sit for a couple minutes. Heat a skillet over med-high heat and add the peanut oil. Once hot, fry the tempeh for about 3 minutes on each side, until browned. Serve with rice. (Try to?) enjoy.